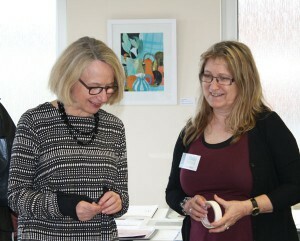 This weekend saw the launch of the Button Box Project. We were very proud to welcome the author of The Button Box, Lynn Knight. Lynn visited Studio11 to see the project for herself, and then proceeded up to the Birley Centre for a well attended ‘in conversation’ hosted by our very own Christine Chester! Lynn Knight (left) talking to Roz Nathan in Studio 11. 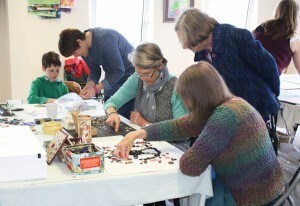 We had lots of visitors to Studio 11 over the first weekend of the Button Box Project…. …. 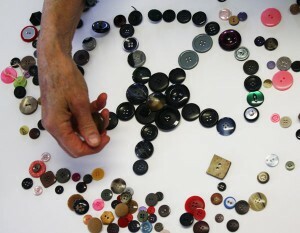 and they joined with us in sorting and arranging some of the many buttons we had available …. 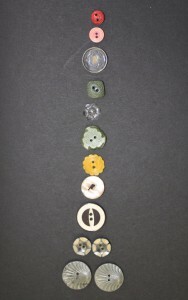 … this first phase of the Button Box Project will be running again next weekend. 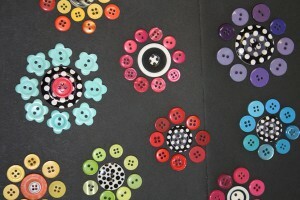 So come along and join us for some button fun; Saturday and Sunday, 23 & 24 April from 11am – 5pm at Studio 11.